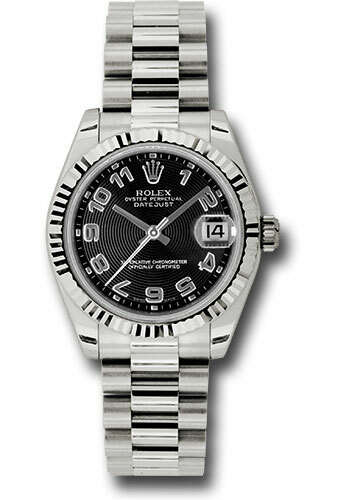 31mm 18K white gold case, screw-down crown with twinlock double waterproofness system, fluted bezel, scratch-resistant sapphire crystal with cyclops lens over the date, black concentric circles dial, Arabic numerals, Rolex calibre 2235 automatic movement, President bracelet with semi-circular three-piece links, concealed folding Crownclasp buckle. Waterproof to 100 meters. 31mm 18K white gold case, screw-down crown with twinlock double waterproofness system, fluted bezel, scratch-resistant sapphire crystal with cyclops lens over the date, black dial, 10 diamond hour markers, Rolex calibre 2235 automatic movement, President bracelet with semi-circular three-piece links, concealed folding Crownclasp buckle. Waterproof to 100 meters. 31mm 18K white gold case, screw-down crown with twinlock double waterproofness system, fluted bezel, scratch-resistant sapphire crystal with cyclops lens over the date, black dial, index hour markers, Rolex calibre 2235 automatic movement, President bracelet with semi-circular three-piece links, concealed folding Crownclasp buckle. Waterproof to 100 meters. 31mm 18K white gold case, screw-down crown with twinlock double waterproofness system, fluted bezel, scratch-resistant sapphire crystal with cyclops lens over the date, black dial, Roman numerals, Rolex calibre 2235 automatic movement, President bracelet with semi-circular three-piece links, concealed folding Crownclasp buckle. Waterproof to 100 meters. 31mm 18K white gold case, screw-down crown with twinlock double waterproofness system, fluted bezel, scratch-resistant sapphire crystal with cyclops lens over the date, blue dial, 10 diamond hour markers, Rolex calibre 2235 automatic movement, President bracelet with semi-circular three-piece links, concealed folding Crownclasp buckle. Waterproof to 100 meters. 31mm 18K white gold case, screw-down crown with twinlock double waterproofness system, fluted bezel, scratch-resistant sapphire crystal with cyclops lens over the date, blue dial, index hour markers, Rolex calibre 2235 automatic movement, President bracelet with semi-circular three-piece links, concealed folding Crownclasp buckle. Waterproof to 100 meters. 31mm 18K white gold case, screw-down crown with twinlock double waterproofness system, fluted bezel, scratch-resistant sapphire crystal with cyclops lens over the date, blue dial, Roman numerals, Rolex calibre 2235 automatic movement, President bracelet with semi-circular three-piece links, concealed folding Crownclasp buckle. Waterproof to 100 meters. 31mm 18K white gold case, screw-down crown with twinlock double waterproofness system, fluted bezel, scratch-resistant sapphire crystal with cyclops lens over the date, bronze diamond Roman VI dial, Roman numerals with 11 diamonds set on VI, Rolex calibre 2235 automatic movement, President bracelet with semi-circular three-piece links, concealed folding Crownclasp buckle. Waterproof to 100 meters. 31mm 18K white gold case, screw-down crown with twinlock double waterproofness system, fluted bezel, scratch-resistant sapphire crystal with cyclops lens over the date, mother-of-pearl dial, 10 diamond hour markers, Rolex calibre 2235 automatic movement, President bracelet with semi-circular three-piece links, concealed folding Crownclasp buckle. Waterproof to 100 meters. 31mm 18K white gold case, screw-down crown with twinlock double waterproofness system, fluted bezel, scratch-resistant sapphire crystal with cyclops lens over the date, mother-of-pearl diamond Roman VI dial, Roman numerals with 11 diamonds set on VI, Rolex calibre 2235 automatic movement, President bracelet with semi-circular three-piece links, concealed folding Crownclasp buckle. Waterproof to 100 meters. 31mm 18K white gold case, screw-down crown with twinlock double waterproofness system, fluted bezel, scratch-resistant sapphire crystal with cyclops lens over the date, mother-of-pearl dial, Roman numerals, Rolex calibre 2235 automatic movement, President bracelet with semi-circular three-piece links, concealed folding Crownclasp buckle. Waterproof to 100 meters. 31mm 18K white gold case, screw-down crown with twinlock double waterproofness system, fluted bezel, scratch-resistant sapphire crystal with cyclops lens over the date, pink dial, 10 diamond hour markers, Rolex calibre 2235 automatic movement, President bracelet with semi-circular three-piece links, concealed folding Crownclasp buckle. Waterproof to 100 meters. 31mm 18K white gold case, screw-down crown with twinlock double waterproofness system, fluted bezel, scratch-resistant sapphire crystal with cyclops lens over the date, purple diamond Roman VI dial, Roman numerals with 11 diamonds set on VI, Rolex calibre 2235 automatic movement, President bracelet with semi-circular three-piece links, concealed folding Crownclasp buckle. Waterproof to 100 meters. 31mm 18K white gold case, screw-down crown with twinlock double waterproofness system, fluted bezel, scratch-resistant sapphire crystal with cyclops lens over the date, pink dial, index hour markers, Rolex calibre 2235 automatic movement, President bracelet with semi-circular three-piece links, concealed folding Crownclasp buckle. Waterproof to 100 meters. 31mm 18K white gold case, screw-down crown with twinlock double waterproofness system, fluted bezel, scratch-resistant sapphire crystal with cyclops lens over the date, pink mother-of-pearl dial, 10 diamond hour markers, Rolex calibre 2235 automatic movement, President bracelet with semi-circular three-piece links, concealed folding Crownclasp buckle. Waterproof to 100 meters. 31mm 18K white gold case, screw-down crown with twinlock double waterproofness system, fluted bezel, scratch-resistant sapphire crystal with cyclops lens over the date, pink dial, Roman numerals, Rolex calibre 2235 automatic movement, President bracelet with semi-circular three-piece links, concealed folding Crownclasp buckle. Waterproof to 100 meters. 31mm 18K white gold case, screw-down crown with twinlock double waterproofness system, fluted bezel, scratch-resistant sapphire crystal with cyclops lens over the date, dark rhodium dial, floral motif, Rolex calibre 2235 automatic movement, President bracelet with semi-circular three-piece links, concealed folding Crownclasp buckle. Waterproof to 100 meters. 31mm 18K white gold case, screw-down crown with twinlock double waterproofness system, fluted bezel, scratch-resistant sapphire crystal with cyclops lens over the date, rhodium dial, Roman numerals, Rolex calibre 2235 automatic movement, President bracelet with semi-circular three-piece links, concealed folding Crownclasp buckle. Waterproof to 100 meters. 31mm 18K white gold case, screw-down crown with twinlock double waterproofness system, fluted bezel, scratch-resistant sapphire crystal with cyclops lens over the date, silver dial, 10 diamond hour markers, Rolex calibre 2235 automatic movement, President bracelet with semi-circular three-piece links, concealed folding Crownclasp buckle. Waterproof to 100 meters. 31mm 18K white gold case, screw-down crown with twinlock double waterproofness system, fluted bezel, scratch-resistant sapphire crystal with cyclops lens over the date, silver diamond sapphire 6 and 9 dial, 8 diamond hour markers, Arabic 6 and 9 set with 32 sapphires, Rolex calibre 2235 automatic movement, President bracelet with semi-circular three-piece links, concealed folding Crownclasp buckle. Waterproof to 100 meters. 31mm 18K white gold case, screw-down crown with twinlock double waterproofness system, fluted bezel, scratch-resistant sapphire crystal with cyclops lens over the date, silver dial, index hour markers, Rolex calibre 2235 automatic movement, President bracelet with semi-circular three-piece links, concealed folding Crownclasp buckle. Waterproof to 100 meters. 31mm 18K white gold case, screw-down crown with twinlock double waterproofness system, fluted bezel, scratch-resistant sapphire crystal with cyclops lens over the date, white dial, index hour markers, Rolex calibre 2235 automatic movement, President bracelet with semi-circular three-piece links, concealed folding Crownclasp buckle. Waterproof to 100 meters. 31mm 18K white gold case, screw-down crown with twinlock double waterproofness system, fluted bezel, scratch-resistant sapphire crystal with cyclops lens over the date, white dial, Roman numerals, Rolex calibre 2235 automatic movement, President bracelet with semi-circular three-piece links, concealed folding Crownclasp buckle. Waterproof to 100 meters.